When our four-month-old son developed small bumpy red patches on his legs, our pediatrician diagnosed eczema. His solution — slather our son’s skin with moisturizers. Instead of getting better, our baby’s eczema went out of control. A painful-looking, blistery red rash blossomed over his entire body and face, even his scalp. Some patches bled, oozed, and crusted over. At the stage when babies should be smiling and wiggling for the sheer joy of movement, our son stopped. He scratched himself incessantly, even through layers of clothing, leaving long claw-like trails through his already raw, blistered skin. 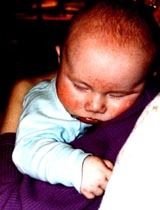 His open rashes became easily infected and stopped healing in that miraculous, rapid way of healthy baby skin. To watch this is truly heartbreaking. Stopping the “hypoallergenic” moisturizer didn’t make the eczema go away. Our experienced, trusted pediatrician seemed annoyed at our attempts to analyze the breakouts and find the cause. “It’s random,” he said, “You just have to accept that your son gets skin rashes for no apparent reason.” The rashes did seem to fluctuate randomly. It was easy to believe that everything was causing it. Before reading those sentences, we thought of detergent allergies only as individual product, perfume or additive sensitivities. 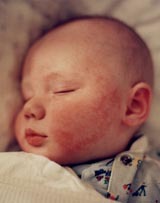 Most books suggested detergents and soaps are equally irritating to infants with eczema, telling parents to avoid both. Without realizing it at first, my husband and I made a subtle but critical shift in our thinking: we began to make a distinction between soaps and detergents as chemical classes. When we eventually eliminated all detergent-based products from our laundry and home, and replaced them with different soap products, we were also able to eliminate all of our son’s eczema. His skin cleared and began to heal normally again. It felt soft and supple, like healthy baby skin. 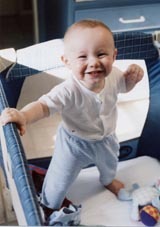 Our son began moving again for the joy of it, peddling his legs, rolling and exploring, smiling and giggling constantly. Before we discovered the cause, we could barely take our son to church without a horrendous rash developing over any exposed skin. Now he could tolerate more and more dry contact with detergent outside the home. He could lead a normal life. More than four years later, our son still broke out from significant contact with detergent, but we could almost always predict when it would happen, and we knew how to eliminate the breakouts quickly. Eliminating detergent from our home environment turned out not to be as simple as switching to soap flakes in the laundry. It took four months of careful observation and detective work to track down all the sources of detergent in our home environment, and until we did, even we didn’t see that different detergents were the entire cause of the problem. Detergents were invented around World War II, and initially at least, were only commonly used in the laundry. The reaction of some infants must have been obvious then, as one of our elderly friends said, “In my day, everyone KNEW to wash baby clothing only in soap flakes.” Most other products, like shampoos, remained soap-based — my husband’s aunts still remember the vinegar rinses they used to get the residues out of their hair. Once, the difference between detergents and soaps stemmed from the basic ingredients: soaps were derived from plant or animal fats, detergents from petroleum. Detergent chemistry circumvented some of the problems of soaps, such as the formation of “scum” in hard water. There now seem to be plant-based products with the same cleaning and molecular properties of detergents — commonly available in natural food stores — perhaps more appealing to some consumers, but a complication for solving my son’s eczema, because many of these products are not helpful in the case of his reaction, but they are understandably labeled as soap-based. Finding pure soap products — that didn’t make our son more susceptible to detergents by drying his skin, either — was a challenge. After solving our son’s problem empirically, I’ve tried to understand it from a biological perspective by talking to chemists, microbiologists, and doctors. Given my present knowledge — which is far from complete — I believe the problem is related to skin membrane permeability. Detergents increase skin membrane permeability in a way that soaps and water do not. This type of eczema — which I now believe is probably 25-60% of the eczema problem, depending on the age group and locality — seems purely to result from how detergents increase the permeability of skin. The behavior of the eczema is entirely consistent with that premise. When my son and other children like him are not exposed to detergents at home, their skin becomes normal and isn’t especially dry. There is no need even to moisturize. Understanding these issues proved essential to maintaining the improvements, because we found that simply washing our son’s skin and clothing in water only — despite Herculean rinsing — was not enough to remove the detergent residues, and in fact sometimes caused an outbreak if he had residues on his skin from contact during the day. Such residues are hard to avoid, as detergents seem to be a major component of household dust: from skin flakes, hair, lint, and washed surfaces. In a typical household today, the following products are almost always detergent-based or contain detergents: laundry products, including “hypoallergenic” ones for babies (Ivory Snow became a detergent product about ten years ago and is no longer soap flakes, Dreft is a mild detergent, but it is still a detergent); dishwashing liquid; dishwasher powder; liquid and many bar “soaps”; kitchen, bathroom and other household surface cleansers; shampoo and body washes; toothpastes (including “natural” ones); many cosmetic products, creams, and moisturizers; and many processed foods. To get rid of our son’s breakouts, we had to completely remove all detergent sources in our home — otherwise, the breakouts remained unpredictable and our son’s skin didn’t heal completely. Just touching his skin with water from a clean dish out of the dishwasher, which we hand scrubbed under the tap for good measure, was enough to give him serious contact eczema within 30 minutes. The water direct from the tap did not cause such breakouts. Our son’s face didn’t clear up completely until we began washing our own hair in a soap-based shampoo. Since solving our son’s problem, we’ve come across others with the same problem. Helping them has proved to be an involved process. Eczema can be caused by other things, such as foods; removing enough detergents from the home environment to determine that they are the problem requires a significant amount of work, and there are many pitfalls. For example, in trying to help others, I discovered that detergent residues in clothing must be completely removed by the soaps, or the intermediate stage is actually more irritating. Someone switching to soap flakes only temporarily could easily think their child was more allergic to the soap. Simply eliminating detergents and using only water for household washing wouldn’t lead to this solution, either. Eliminating the residues with water alone is unrealistic. Removing enough detergent residue from our son’s car seat cover to keep him from reacting — it had been washed in detergents only once since we bought it — required six water-only washes in our high quality front loader, over twelve hours of washing, including 24 rinses. Removing equivalent residues with soap requires only one or two washes. We could easily have confused our son’s problems with food allergies as well. Many prepared foods, especially jarred and canned foods, also seem to contain significant enough traces of detergents to give our son contact eczema and later breakouts from ingesting them. Detergent residues from pots, pans, dishes and utensils can also be significant. When we started feeding our son solids at six months, at first we thought he was allergic to every food, even though we had already switched to soap flakes in the laundry, and soap to wash household surfaces. I have helped friends in my immediate circle and other families in my community, and I’ve read myriad web pages, research papers, and parenting sites where I see numerous probable cases of this type of eczema, but not one description of this solution. It’s not surprising — the kind of detailed observations we had to make over an extended period of time in order to determine the cause of our son’s eczema are not really possible to do in a doctor’s office or even a normal research setting. I think it would help parents of children with eczema a lot if researchers took on one large study in which they resolved to figure out the cause(s) of — i.e., clear up — EACH CASE of infantile eczema 100% (which I’m convinced is possible), then charted the range of causes and how much eczema in the population comes from each cause. Then from a study like that, they could develop procedures to give parents to help them figure out their own kids' cases — with the list of possible causes as a guide — because ultimately, pediatricians can't realistically do it from their offices. People have to be their own detectives, but it would make all the difference if they had the information to do it. Finally, in researching this problem, I've discovered that our solution is consistent with what may be the solution to the overall problem of rising infantile eczema and asthma. The problem has been described as far worse in industrialized countries (up to 20% of children in Japan), acquired at the same rates by people who come from underdeveloped to industrialized countries (detergents are in far greater use in the latter), increasing every decade since WWII (around when detergents were invented), worse in areas that have hard water (with which there is inferior rinsing and less use of soap products). Detergents affect skin membranes in a way that is entirely consistent with the behavior of this eczema. The only theories about it are that we are too clean, the so-called hygiene hypothesis. As for the studies that ostensibly support it, they typically demonstrate a more direct causal link with detergent use than lack of germs.